One of my riding buddies has recently been bitten by the Britbike bug and brought this machine to my attention. It’s a really neat example of why I like these sorts of café bikes: like old American muscle cars, you can mix and match and really make them your own, if you’re not particularly concerned with originality and don’t subscribe the insidious Numbers Matching club. 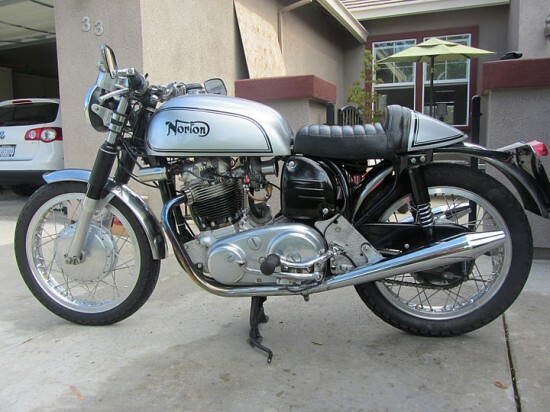 This particular example appears to have a 1964 Norton Atlas frame stuffed full of 750 Commando goodness and is festooned with all of the best period Rocker bling. 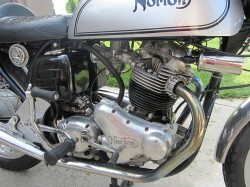 The change to the Commando engine is not explained by the seller, but the bike would likely receive the same benefits as the Commando when compared to the Atlas: improved center of gravity, increased space for carburetors, and rakish good looks. 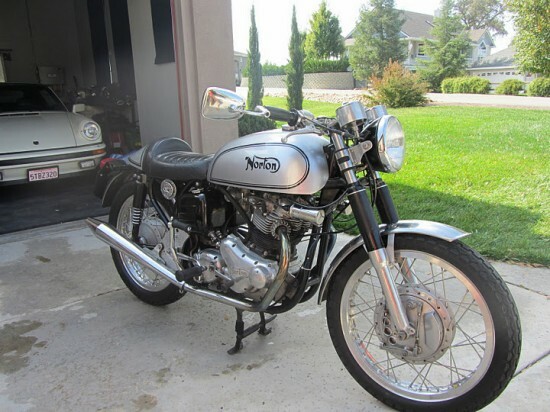 It’s hard to say what sort of performance this bike has for sure and the seller makes no claims, but a healthy Norton twin should make 50-odd hp, enough to comfortably keep up with modern traffic and provide plenty of back-road entertainment. At the time of this writing, the bidding is up to $4050.00 with the reserve not yet met. No surprise, given the apparent quality of the bike on offer. Hi. I was searching around the Internet and noticed your post. 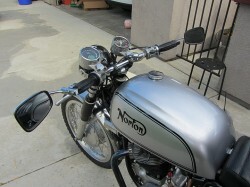 I am the owner of this 1964 Norton Cafe. It was sold to me by a friend of the guy who owned it. The previous owner passed away. His wife claims it came they owned it since new. I dont know a lot of history about the engine swap. I think it was probably done 5-6 years ago. I found a blog online from the previous owner(Richard cook aka cookie).. The engine is out of a 72 commando combat according to the serial numbers, but it’s titled as a 71. The frame is 1964 featherbed. All Norton. The cool thing about it is that everything on it is period correct. And it is a blast to ride! Although, yes it does vibrate….but the smiles you get from riding it are totally worth it. I hate to sell it, but another new baby means I’ve got to let a few toys go. It is still for sale if you know anyone who is interested. Im looking to get somewhere between 7500 and 8000. Let me know if you have any other questions or call me at 2097470970. Nice article!